ëAlready Kit Armstrongís musical insight and concentration, his ear for sound and balance Ö are remarkable by any standards Ö he combines freshness and subtlety, emotion and intellect,í says Alfred Brendel. To Bach Kit Armstrong applies stylish command and uncluttered musicianship, and to Mozart and Beethoven faultless articulation and sensitive phrasing. The three pictures of Debussyís difficult Estampes call for a contemplative quality in ëPagodaí, restrained passion in ëSoirÈe dans Grenadeí and a distant coolness in ëJardin sous la pluieí, while his interpretation of Chopin brims with improvisatory spontaneity. 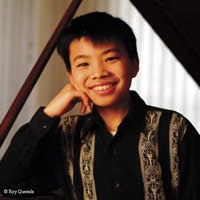 Hear this exceptionally gifted pianist on his certain way to international stardom.